When Yello first launched its social place-sharing app for the iPhone a few months ago, we had a hard time making sense of how it fit in alongside existing location-centric services like Foursquare, Yelp and even Instagram. The startup has since gone back to the drawing board and come out with a new version of its app that’s easier to grasp. With most of us experiencing acute social networking fatigue, it’s going to be extremely difficult for Yello to gain traction. I shudder at the thought of having yet another profile to maintain. Still, I selfishly want this app to succeed because it’s aimed directly at a problem that has yet to be solved by other similar services. Yelp has probably come the closest. It’s almost a given that I’ll check the app when I’m out somewhere new, but it’s not very easy to use and I tend to skip over the social features. I have a few friends that regularly post reviews, but it’s hit or miss depending on the neighborhood. 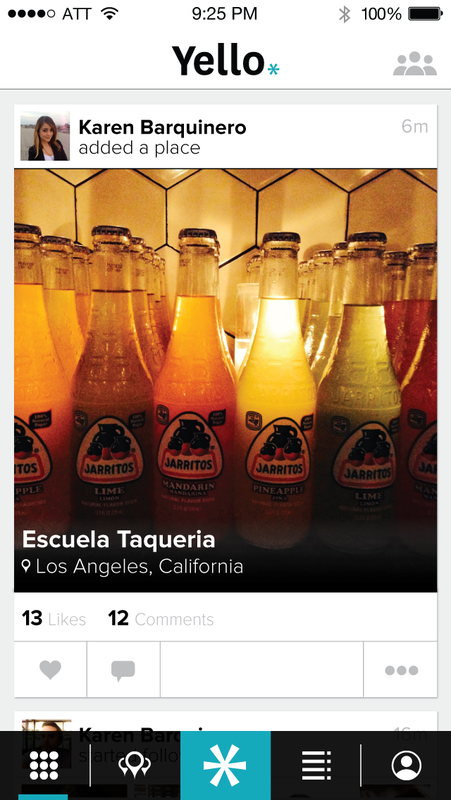 Improvements to Foursquare’s discovery and recommendation engine have made it significantly more useful, but the fact that users post everywhere they go makes it too noisy. In a sense, Yello has set out to offer users the same specificity and visual references that Foodspotting has accomplished with individual dishes, but for places. It’s a fairly natural use case. We ask our friends questions like, “What’s the best sushi place in downtown LA?” or “Where can I find the best Peking duck in Beijing?” all the time, so it’d be great to have searchable records of those recommendations. Searching on Yello is fairly basic. 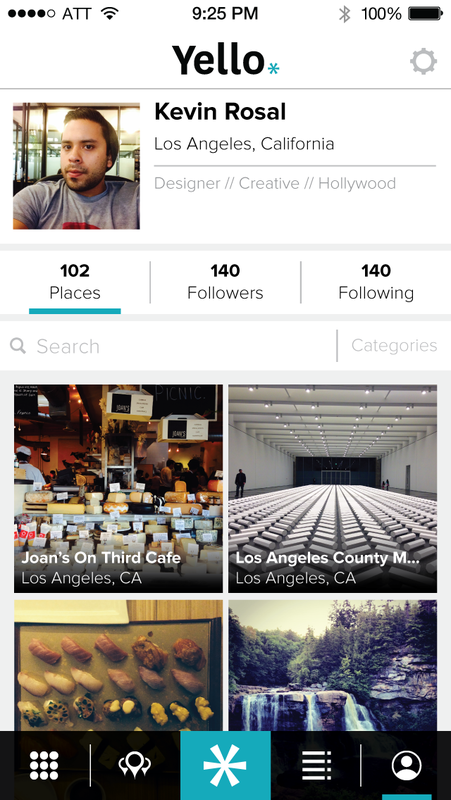 You can filter by distance or category, and search within your own network or the community. The main issue for Yello right now is critical mass – the app would be killer if it had enough data from influencers (food critics, for instance) and friends. However, the same could be said of hundreds of social apps, so the question remains whether it has what it takes to catch on. Yello has an attractive design and stylish branding, but it’s too early to tell whether it has the special sauce needed to become a hit. I also have two concerns about the current iteration of the app. It’s not clear what happens to photos once they’re uploaded to the service. Photos get attached to their respective locations, but they don’t seem to be tied back to the users that posted them. 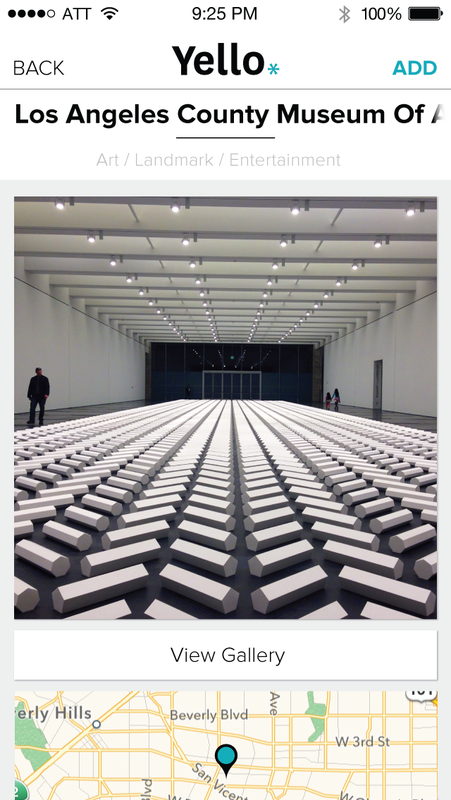 Yello would do well to learn from Instagram’s spat with its users over photo ownership. The service also needs a wish list or better tagging system. If I see a post I like, I can hit “Add” to add it to my map or share it on Facebook and Twitter. If Yello is meant to be a curated list of my favorite places, it needs a separate section where I can save places that I haven’t been to yet but look interesting. Yello founder Daniel Gendelman said in an interview that he came up with the idea for the app on a visit to LA. He’d been to the city several times before and never really clicked with it, but this particular time, his friends took him around to their favorite neighborhood spots and he had an incredible time. In his view, other services are too broad to offer that level of recommendation. Asking for a recommendation on Facebook could get a response from someone you barely knew in high school, while a Twitter request often goes out to mostly strangers. That’s not to say that those recommendations are inherently bad, as many of us get great tips from those networks, but they’re not designed for the personalized and specific recommendations. According to Gendelman, Yello has already attracted a few heavy users that are extremely thorough about binge-adding the places that matter to them. That bodes well for the app’s chances of survival, as a committed core of users such as foodies and live music aficionados would populate the service with extremely valuable data. Yello has a long road ahead if it’s to take on existing location-based social services. Gendelman believes that his product has an advantage because it doesn’t have the challenge of reeducating users about how to it. For that to happen, he’ll need to convince users to sign up first.